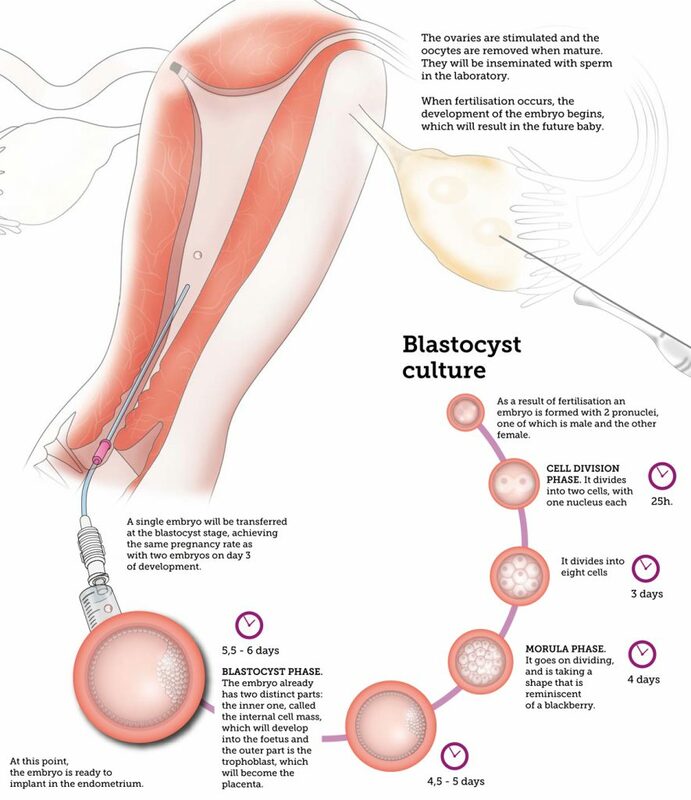 The transfer of embryos at the blastocyst stage is one of the steps in the In Vitro Fertilisation process. The egg is inseminated with sperm in the laboratory. When fertilisation occurs, the embryo starts to develop, which will result in the future baby. The blastocyst is the stage the embryo is at after 5 or 6 days of development in the so-called cell division process. In which cases is it recommended to perform the blastocyst transfer? What is the advantage of blastocyst transfer? In an In Vitro Fertilisation cycle, the oocyte is inseminated with spermatozoa in the laboratory. When fertilisation occurs, the development of the embryo begins, which will lead to the future baby. That embryo remains in the laboratory for between 2 and 6 days, in which time it will become an organism composed of several cells ready to be implanted in the uterus of the mother-to-be. The blastocyst is the stage of the embryo after 5 or 6 days of development in the so-called cell division process. Under natural conditions, it is precisely at this stage that the embryo is ready to implant in the endometrium. However much we strive to recreate conditions similar to the human body, not all embryos manage to reach that stage in the laboratory. Depending on the quality of oocytes, spermatozoa, and other factors, only a few of them will succeed in developing to the blastocyst stage. In which cases is it recommended to perform the transfer at the blastocyst stage? The time when the embryo is transferred to the uterus of the mother-to-be depends on each particular case, and it will be your doctor, together with the advice of the embryologist, who tells you whether, depending on your situation, it is advisable to opt for a transfer at the blastocyst stage. In this way, the doctor and the embryologist will always propose the cycle that suits you best in accordance with your results. Our main objective is to offer the greatest chance of getting pregnant. At the blastocyst stage, the embryo is more developed and is at the phase corresponding to its implantation in the endometrium. For this reason, the blastocyst has a greater possibility of resulting in a pregnancy by transfer, this being one of its main advantages. In the In Vitro Fertilisation treatments with donor eggs, in particular, the embryo transfer of a single embryo at the blastocyst stage is equivalent to the transfer of 2 embryos at day 3. Thus, in all IVF treatments with one’s own eggs or donor eggs, whenever possible, the embryo transfer will be done when the embryo is at the blastocyst phase. We understand that some women want a twin pregnancy. However, from a medical point of view it is not the most appropriate situation. Our mission is to aim for pregnancy by minimising the possibilities of complications to the utmost, and with advice adapted to each patient. In the transfer of embryos at the blastocyst stage, the possibility of a twin pregnancy is greatly reduced, since with the transfer of a single blastocyst we obtain approximately the same pregnancy rate as with two embryos on day 3 of development, assuming an extremely low risk of a twin pregnancy. Thus, we obtain the same pregnancy rate by transfer with a much lower potential for medical complications.